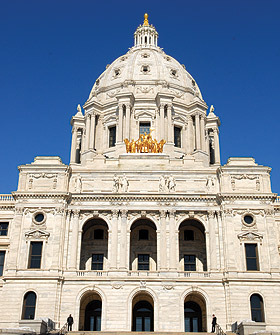 Augsburg students are invited annually to participate in the Minnesota Private College Council Day at the Capitol taking place this year on Thursday, April 6. Each year students head to the Capitol to advocate for these funds for themselves and also future students. Please join fellow students for Augsburg’s Day at the Capitol April 6. Participating in this day is a great want to learn about advocacy and make a real difference for students who depend on the state grant each year. We will all travel to the Capitol together on April 6. Check in is at 7:45 a.m. in the Oren Gateway Center Atrium on April 6 and the group will return by 3 p.m.
For questions, please contact Lee George, Foundation & Government Relations, at LGeorge@augsburg.edu or 612-330-1629. There were 1,011 State Grant recipients on campus last academic year — that was 35 percent of all Augsburg undergraduates. The average State Grant award at Augsburg was $4,615. In total, more than $4 million in State Grant awards were made to Augsburg students. Targets low- and middle-income families with greatest need. Holds down additional borrowing and extra hours at part-time jobs. Invests in state’s human capital and future economy.